There is now 4 colonies producing iron here, they will be able fill this order. Because of that and all the issues/bugs with stock markets I am not accepting any new suppliers anymore. Interested in building a colony and earn 250 billion? The gate from CannibalCarbs to New Horizon needs 500 million tons of iron, to support this I am setting up a OSB in CannibalCarbs that will buy all the needed iron for the gate. Price will be 500 per ton, a total of 250 billion if all is supplied. I will set up NPCs to trade between any iron producing colony and my OSB, so it will be quick and easy to haul it into the gate. All you need to is build up a colony that is producing iron and selling it at its Stock Market for 500 per ton. The colony most be located in the CannibalCarbs system, so that my NPCs can get to it. You can choose freely which planet to colonize. After all the iron is supplied the system will be connected by the gate to New Horizon and the rest of the gated network (Menzel 3, Ceres, Apollo etc), meaning your colony will have full access to trade via gates for easy supply of food etc and to sell its prodution. So even after earning 250 billion your colony will still have a purpose. There is no minimum production requirement, I will buy from any colony producing iron in CannibalCarbs. I buildt a colony for the same purpose at Niu Heimar to supply gating that system. Its the Ferrus colony and it outputs more than 2 million tons a day, even though its just a small colony with 14k buildings. Visit it to see what it means to build a iron producing colony. A colony like that in CannibalCarbs would earn 1billion a day. My OSB out there is already under construction. Ps. Carefull when you jump in to Cannibalcarbs, there is 3 planned gates at the entrypoint, if you have any carbon or iron on board it will be supplied to the gates when you click the autopilot. You need to fly away from the gates first to avoid this. Last edited by Loke on Fri Oct 12, 2018 7:17 pm, edited 2 times in total. OSB is up and running, ready to buy iron. Im not going to post stats for planets or anything, Ill leave that to those who are interested in colonizing here to figure out where to settle. Feel free to ask if something is unclear or if there is need for support for something. I really love this idea. I hope someone new settles and gets to producing. ok probing planet now to see what it is like. I really like this idea of yours. if I can possibly do it I will. will have to see how the domes thing works out though. any suggestions from you would be helpful. Yeah, this is not the easist place to build your first colony, but should be a nice challenge when most of the basic colony building is figured out and you are ready to get into more advanced stuff and get the full colony building experience. It takes time but are really fun to master. I havent really looked into the details of how the planets are to build on in CannibalCarbs, but should be at least 2 ways of making some iron. Planet without atmosphere has high potential of iron production, but requires more skill to set up efficently. Planet with atmosphere is simpler to make domes work but migth not produce that much iron. -Plan 10 domes on non-productive land (will not place mines or farms on those). -Build some auto power plant to power the domes. 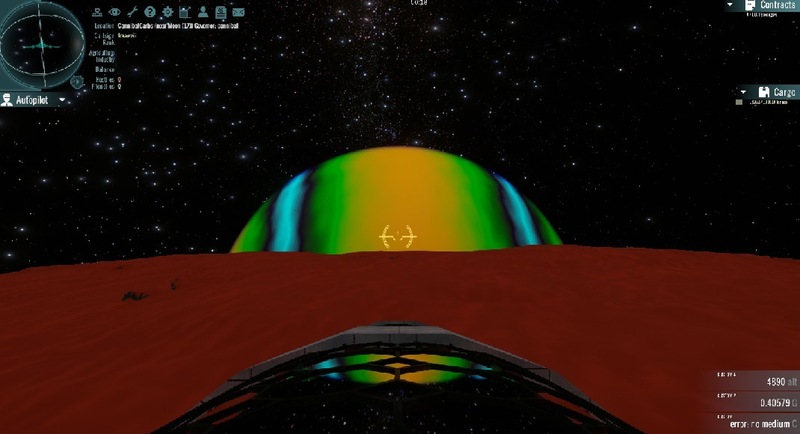 Polarize and modgrav needs to be calculated for each planet. To calculate your polarization number, divide 1 by the radiation your dome receives. You will not be able to find the Radiation level until you have a completed dome. When you click on a completed dome the first line will show base radiation. Changes the level of gravity within the dome. Ideally this should be set to the difference between external gravity and 1. If a planet has over 1g, modgrav -## (## represents the number to be subtracted) is used where the number is 1 less then the gravity. If the planet is below 1g, then modgrav ## is added to get to 1g. -Haul in gas for domes, need 2 Lev loads per dome. I use 1 full lev with N2, second load 500 water, 90k O2 and the rest is N2. Unload gas to dome and it will be habitabal as soon as temp is ok, which is much faster than a dome buildt on planet with atmo. -Plan lots of wharehouses and SM. Should have at least 5 million storage space. -Set up buy orders for N2 and O2. You need 3 times as much N2 as O2. -Have npcs bring in the N2 and O2. -With a nice supply of gas in storage keep building domes, when supplying new domes load directly from wharehouse and unload directly to domes. no flying back and forth required! -Keep building domes and build up needed buildings for production in them. Getting iron production up early is useful, less hauling of iron to supply colony expansion. Entertainment etc for morale. -Build univeristies early, it takes time to educate and you should therefor have unis working as soon as possible. Important both for morale and efficency. -Keep expanding and build up production. Also needs lots of offices, migth need as much as 1 to 6 ratio offices to mines/farms. Ill add more to the list later if something comes to mind. I left out all basic colony building knowledge, as this is more ment as help for building efficently. I have 3 npc Levs ready in CannibalCarbs, if any of you need something traded between colonies or OSB (gas, food etc.) let me know and Ill set them to work. Just remember to have at least 1 credit difference between selling SM and buying SM. Hi, is this offer still open or do you allready have all the iron you needed ? If it is still open I would like to build my first big colony there and start digging up iron. you know how it goes, " ... seemed like a good idea, at the time ... "
haven't worked an airless site before, so this could be interesting ! !